The trees Commiphora myrrha and Boswellia sacrum belong to the family of the Burceracae (Sapindales order). Both trees produce aromatic resins, known as the biblical incense (olibanum) and as myrrh. These resins were the most costly and were gifts for baby Jesus. Myrrh was given as a symbol of suffering. Aound the time of Christ's birth, myrrh was three times as expensive as incense but the demand for incense was five times greater. Most of the old texts about medicine contain references about the use of incense and myrrh from about four thousand before Christ. The trees grew in large numbers in southern Arabia, presently Yemen and Oman, on mostly chalky ground and in intense heat. They were almost the only plants that could grow in these conditions and their exact location was kept secret. The resins were transported by camel via a desert route of 3000-4000 kilometers. Around 300 before Christ, more than 3000 tons per year were exported, mostly to Egypt, Syria, Palestine, Greece, and the Roman Empire. Incense and myrrh were used at funerals to honour the dead, for salving kings and prophets (myrrh), for embalming the deceased ((myrrh), and in medicines and perfumes. The harvesting of the resins is made by carefully cutting into the bark, where drops slowly appear in the form of tears. Myrrh means bitter, from the Arabian word 'murr', and has a heavy fragrance when burned. 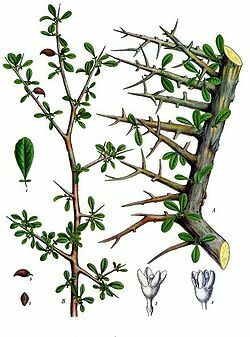 Incense, or frankincence, comes from the Old French ‘franc’, which means pure, and ‘incensum’, which means to fire up, to enlighten..
Two hundred and fifty species of Commiphora have been documented; most of them have thorns. In the descriptions of the medicinal use of myrrh throughout the ages, one can notice that it has been used as a panacea, a wonder remedy that could cure everything: chilblains, mouth infections, colds, thyroid conditions, lung conditions, headaches, vertigo, distorted vision, wounds, hemorrhoids, menstruation problems, prolapse, infertility, ulcers and rheumatic pains. It is my experience that myrrh and olibanum suit people who have pure intentions. They give and give, they happily help others but have difficulties in receiving. Sensitive and yet strong, they are go-getters. Their most important quality is their sensitivity to others; they can accurately feel what is going on for the other. The problem, however, is that they tend to lose contact with themselves. The healing effect of both remedies (apart from other healing qualities), is that the connection with one’s own thoughts and desires become more developed with the effect that one is not responding solely to the needs of others. They are intermediaries, peace-keepers, and look for harmony. They have a great feeling for responsibility and want to do everything perfectly. They have such high standards that they almost need to be a saint to fulfill them, but are not aware of this since they have the feeling that nothing they do is good enough. They are ambitious in the sense that they are trying to prove they are good. Underneath this, however, lies an enormous feeling of guilt, which they try to avoid feeling as much as they can. The central theme is: separation and death. At some point they have experienced too much pain and they have put this pain away. Their endless giving is an attempt to avoid feeling this pain. Death can be a theme in the current family or a theme in the ancestors. The feeling of people who need Olibanum is light and cheerful. They bring light, and are persistent in that; “It has to be light”. According to Jan Scholten, Olibanum fits in stage 10 and Myrrha fits in stage 13. Myrrha people have the tendency to (half) withdraw. They have more contact with the dark, with their shadow, but they try to avoid it by ‘doing good’ since for them the shadow is connected to panic; the panic of being condemned, of unspoken betrayal, especially betrayal by the group (including the family), whom they should be able to trust. ; “Everything must be good.” It is Judas’ theme. Judas as the betrayer, or as the enlightened one? It is especially in group setting that they have difficulties in staying true to themselves, and have the tendency to withdraw. “It must not be dark”. In Myrrha, the darkness is palpable. The theme of Myrrha is often connected to violence: violence of war, suicide, accidents, drowning. Bitter tears of unresolved sadness. Repressed anger is more clearly present in Myrrha than in Olibanum. It is the theme of biblical guilt, trying to ‘do good’, as described in the Bible, at an almost holy level. Myrrha suits people who truly and honestly try to live in the pure spirit of the Bible. They are not people who are religious for the form, and who are necessarily connected to a particular church. They typically come from a family where one or more of the parents has been very strict, and they have become very strict for themselves. Olibanum and Myrrha are possibly collective remedies for the aforementioned biblical/religious themes: holiness, guilt, and death. I have frequently prescribed Myrrha in the last two or three years. Its healing effect is very convincing and it is a remedy that, next to Olibanum, I have the most confidence in prescribing. I am more familiar with the working of Olibanum now than in 2008 (see Interhomeopathy 2008). Key words of Burseaceae: Holiness, pure, guilty feelings, responsibility, death, separation, sensitive to atmosphere, betrayal, darkness, burn-out, clairvoyance. Mrs A. whom I have followed since February 2000, comes for a consultation. The first thing she mentioned is that her body is completely out of order since the solar eclipse of 11-8-1999. Her menstrual period is different since then. She has intense, violent dreams and very changeable moods premenstrually; she becomes angry and sad. She is afraid to get cancer or a heart complaint and die. She is busy following a training, which is going well, and she is receiving many offers for work but cannot accept them: “I am not good enough.” When she was five years old, she nearly drowned. She had strict parents. During adolescence, she was befriended by a young family who was killed in front of her eyes, as they were farewelling her. She feels very guilty and abandoned: “I always blame myself and I’m afraid of hurting others. I’m afraid of making mistakes. I was never good enough for my parents.” As a child she “knew” things (clairvoyance). She has a fear of small spaces. Physical: Headache from the neck, sinusitis, often head colds. Cracks in fingers. Desires: bread, spices, fruit, savory. In the past, she has done well on Calcium Muriaticum, Thuja and Camphora. After Myrrha, she spontaneously said that the new explanation of Judas’ story had touched her deeply; all became clear for her through the darkness of Judas. After reading comprehensively on: “Was Judas a betrayer or an enlightened one?” She cried a lot. Her feelings of panic have gradually subsided. An argument with her mother has cleared the air between them. She is feeling herself coming back into balance physically. She started a practice, and at this time, she is generally doing well. Mrs. B. suffers from burn-out and feels completely out of balance emotionally. She used to scream once in a while, due to the panic that she was feeling. “I have so much sadness, I don’t know who I am. I push myself to do so much, I have enormous willpower. I am very tense, I place high demands on myself and I try to make others feel happy.” She has used anti-depressants for years. She was a cheerful child, with dyslexia. She has a very dominant mother and her grandmother died when she was eight years old. She had to do a lot for her mother but had the feeling that she could never do it well enough. Her father did not have the slightest interest in her; "No matter how hard I tried, I could never live up to my parents’ expectations.” She loudly voices her opinion when she perceives injustice. She is an excellent school-teacher and feels that she can be herself with the children. Physicals: throat infections as a child, muscular cramps especially in the neck, better from motion. Recurrent bladder infections. Desires: almost everything, especially fruit. She received Olibanum as her first remedy, to which she reacted well. (I did not know Myrrha at that time). She processed much sadness, became less tense, and could reduce her medication. She still needed some anti-depressants, however, to remain in balance. After Myrrha, it went very well for her. She felt herself becoming quieter and stronger; she now dares to say what she thinks. The anger towards her family has almost disappeared. She can be at home without feeling she has to do things. She is doing very well. Mrs. C. is a friendly woman, who works as a team leader, in a children’s day centre. She comes from a wealthy Middle Eastern family. She is physically exhausted, tense, and feels irritated by everything. She has stopped working half a year ago. Her complaints started with high fevers and muscular aches, and recently she had the flu again. She has suffered much trauma from the war and has fled her country. Her brother died of cancer when she was eight and her father died during the war, when she was 13 years old. She used to be cheerful and open but now she feels as she has lost herself. It is not going the way she would like to be with her children, and she feels very sad about that. She would rather not see anyone at all. She is troubled by vertigo and palpitations. She describes herself as flexible, easy to be around, and never angry. Until recently, she was afraid of arguments. She is always ready to help others and she gives easily (her spontaneous words): “Always the other one first!” She is a perfectionist. She regularly dreams about her dead brother and also about her mother, who died a couple of years ago, and who she misses very much. Her greatest fear is losing her children and her husband. She has a great fear of drowning and a fear of heights. Physicals: Pneumonia at 6 years, bronchitis, asthma, repetitive colds, allergy of house mites, sinusitis, frequent headaches, bruises easily, digestive problems (pain, cramps, and constipation), uterine polyps, painful joints in her hands, cramps in calves, muscular pains in her upper arms. Desires: vegetables++; sweets premenstrually. Coffee aggravates+. After Myrrha, she quickly felt stronger and lighter. She now talks more easily, is less emotional, and generally quieter. She has gradually gone back to work, as she feels so much better physically. She deals with her children differently. She is able to accept the things that have happened, and is clearer in what she want and does not want. She feels less alone, places fewer demands on herself, and has more self-respect. In work meetings she is no longer afraid of making a misplaced comment. Mr. D, 80 years old, comes for sleeplessness. He says that he would rather be ill than have this problem. His brother suffers from the same complaint, even worse than he does. As soon as he lies down, he becomes anxious and hot, and has to throw the covers off. He gets out of bed because he needs more space around him. If it is very dark, he becomes panicky, a consequence of wartime. For two years, from fifteen to seventeen years old, he and his brother had to sleep in a hole in the hay, in complete darkness, with a bale of hay blocking the entrance, for fear of reprisal from the Germans after a sabotage. His sleeping problem started several years ago; he could not sleep in a small room or in absolute darkness. He has little energy and takes tranquillizers. He is always busy and is sometimes overly hasty, trying to do everything at once. He is shy and sensitive. According to his wife he is always “good” and helpful. He is empathetic, sometimes too much. He berates himself a lot, especially for the fact that he is so anxious. He has lost a son in an accident; his son fell in the water and drowned. He has difficulties in group situations. He was brought up on a farm and his parents often kept him home from school to help on the farm. He consequently fell behind at school, which gave him the feeling that he was stupid. As he tells me this, his sadness is very palpable. Physical: pneumonia twice, bladder polyps, pacemaker due to irregular heartbeats, aphthae, easy bruising, warm, perspires easily. Desires: most foods, fruit+, fish++, rather savory than sweet. After Myrrha, his sleep and his energy improved and he is looking much more cheerful. Three months later, he is not longer so obsessed by the war and, according to his wife, he is much calmer. They sleep beside each other again and he has the desire to undertake things again. 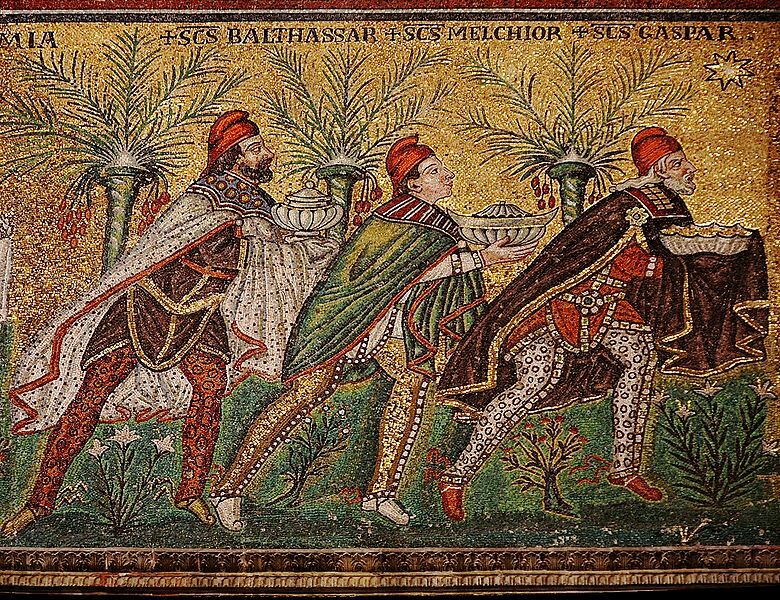 Photo: The Three Wise Men. Detail from “Mary and Child, surrounded by angels”, mosaic of a Ravennate Italian-byzantine workshop completed within 526 AD by the so-called “Master of Sant’Apollinaire”. My impression is that Myrrha is not cancer miasm but rather lies between the cancer and syphilitic miasms: it has the sacrificial elements of cancer, but also the deep pathology and the experience with death of syphilis. For what it&apos;s worth, the extreme sharpness of its thorns also suggests syphilis. Finally, Myrrha has qualities of the leprosy miasm, such as being condemned, noble suffering, and being ostracized. Thank you. I am always fascinated by and grateful for work done with remedies which complement and enhance our understanding of the essential nature of the cancer miasm (its chief representative being Carcinosin), and the whole self/sacrifice of self/ individual/ collective/ issues and struggles which unfold in the Cancer miasm. Quite apart from helping people in general, reflection on the tensions and themes of the cancer miasm are always relevant to any healer's process, I feel.